Philippines is now celebrating for yet another victory from the country's sports icon and number one pound for pound best boxer in the world, Manny Pacquiao. His yesterday's victory made me remember my Gensan visit some few months ago, the night I was able to see the outside of his newest building in General Santos, the JMP Building situated just few feet from my aunt's steak house. I was excited to see the inside of the building then, but alas something happened with the building's generator that very night, just some few minutes after we finished our dinner. Lights were turned off. Next thing I knew, a firetruck and a convoy passed by. Hmm...I was kinda hoping Pacquiao to be at the scene :) Good thing they were able to resolve the problem very quickly and was able to return the electricity. After all, the night is still young. 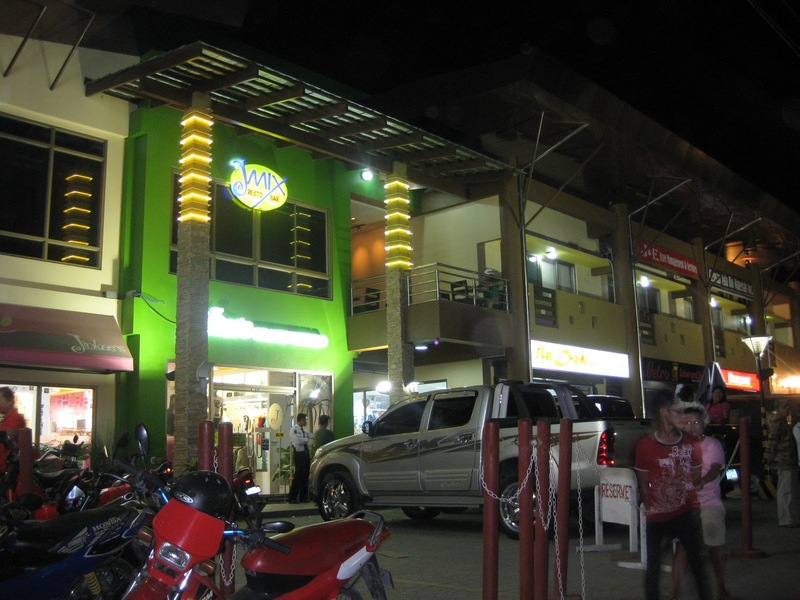 JMP building (named after Jinky and Manny Pacquiao) is located at South Osmena St. General Santos City. The next day, my aunts and I went shopping at Robinsons Gensan. 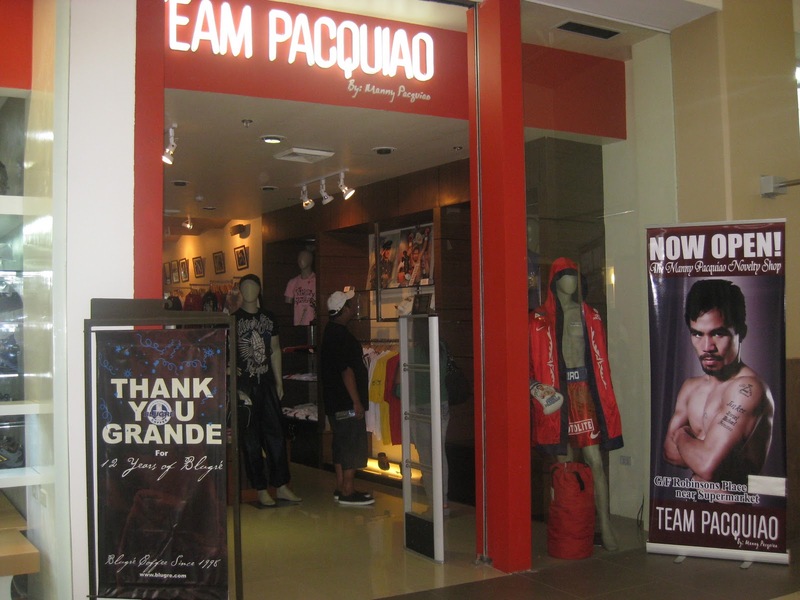 And you bet, I was glad to see the Team Pacquiao Store. For PACMAN fans out there, the store would definitely be heaven. One could buy all sorts of souvenir items from jackets to as little as keychains. For sure tourists would once again flock the store after Pacman's victorious fight against Margarito. I will be flying back to South Cotabato this week for my lola's burial. To my dear readers out there, I would greatly appreciate some prayers for my dearest lola, thanks. Pacquiao fans are dying just to get a piece of his souvenir with his sign on it. 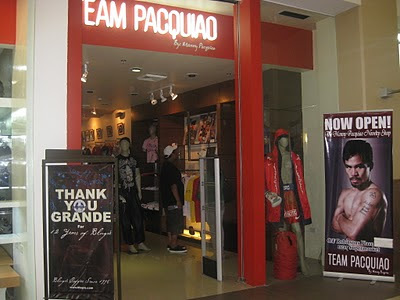 If you can hear me Manny, please put a lot of your store here in Manila. Here's a sample itinerary of what we did. We actually stayed there for 3 days but I'll just share the places we've seen on the first 2 days since the 3rd day was spent on watching the Panagbenga Float Parade. Prior to the trip, I made some internet research before deciding on what places to go to. Feel free to follow our itinerary on your next Baguio trip. The first day was spent on touring my friend on the basic tourist spots of Baguio. Places me and my cousin has actually visited a number of times except for the Good Taste Restaurant. I have lived in Laguna for 19 years but it was only this June 2012 was I able to visit the famous Laguna tourist spot, the Pagsanjan Falls. As much as I enjoyed seeing the falls, the journey, however, was much more memorable than the actual falls itself as we had to endure a 45 minute trek, rappel on a 90 degrees enclosed vertical metal ladder and walk past steep staircases - yeah, this is what you get when availing the cheapest Pagsanjan package. Our weekend was full of unforgettable first time experiences. What's great about this trip was that we were able to do many things in just 2 days and swim in different bodies of water - falls, batis and lake. See, Laguna is more than just hot springs, slides and theme parks. Places we visited: Pagsanjan Falls (via Cavinti Trek), Villa Sylvia Resort in Nagcarlan and Lake Pandin of San Pablo. Last year should have been my first Boracay trip and my first ever Visayas destination. But then it coincided with the Malaysia trip so I had no choice but to cancel Boracay. We all know that flying from Manila to Caticlan has proven to be quite expensive and Piso Fare promos can be daunting to book especially if we are a big family plus the scheduling date is also tricky. But when I learned about 2Go (yes, the famous courier service) sailing from Batangas to Caticlan at a very affordable price, I pitched the idea to my parents.